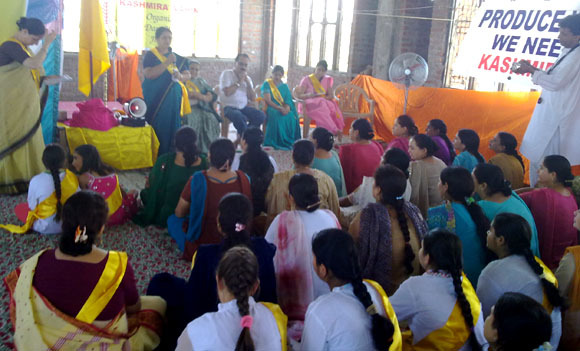 ashmira Vahini a front line organization formed by dedicated and distinguished Kashmiri Pandit Women in exile today pledged its unfailing commitments to cause of displaced Kashmiri Pandit community in a day long organizational workshop at Chakrashwar at Hari Parbat Sanstha Jammu. The said workshop first of its kind was attended by huge number of women delegates from all walks of life comprising young doctors, lawyers, educationist, researchers, professors, engineers, scientists, writers, artists and housewives. The delegates took part in the interactive session deleverd speechs and pledge to conduct seminars,corner meetings and enrollment compaign throughout the country to safeguard the interests of community. The workshop opened with traditional lighting of lamp by Smt.Kirti Kalla and hosting of flag Smt. Sarla Ganhar in the back drop of Shankh Naad by Smt.Vijaya Saproo and welcoming of delegates by Smt. Sudesh Koul coordinator of the program. The inaugural session conducted by Smt. Sunita Santoshi was chaired by Prof. Kailash Mehra 'Nightingale of Kashmir'. 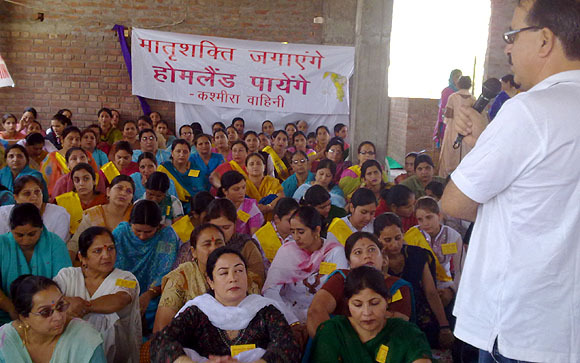 Dr.Agnishekhar convener Panun Kashmir dwelt at length on the position of KP women who have left an impregnable impact on the civilizational ethos of Kashmir from the 5000 year old Yashovati the first known emperors of world to the last Hindu ruler Kotah Rani. 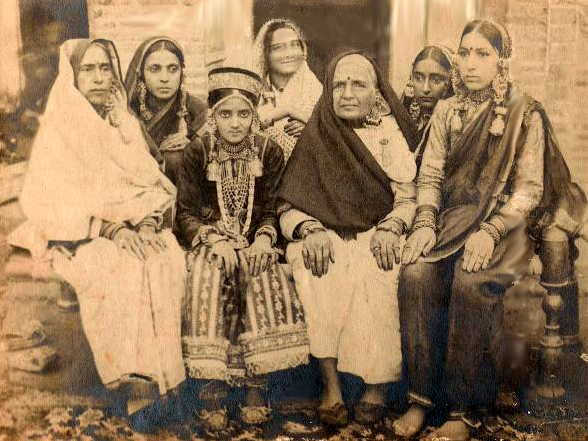 He elucidated the contribution of Kashmiri Pandit Women in field of Litrature, poetry, theatre, art, music, dance, diplomacy, warfare, politics and town planning. Dr. Bawna Raina a panelist in the session made a scientific response towards the need for preserving Gene Pool of Kashmiri Pandit Community. The second mind boggling session conducted by Shweta Bhat was chaired by Prof. Phoola Thusso. Sanjay Raina senior PK activists talked about current developments in the J&K state and response of Kashmiri Pandit’s particularly the woman. Prof. Phoola Koul a panelist in the session appealed the delegates to start a new renaissance in the anals of Kashmiri Pandit community. 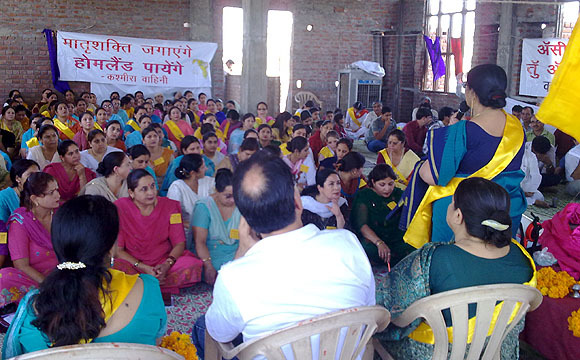 Dr. Shreyali made a passionate appeal to the youth to make efforts to preserve the distinct identity of the community. Concluding session conducted by Nivedita was chaired by Prof. ChanderLekha Raina were in Piyaree Razdan writer poet laid emphasis on maintaining age old rituals structure and traditions of the community for its survival. 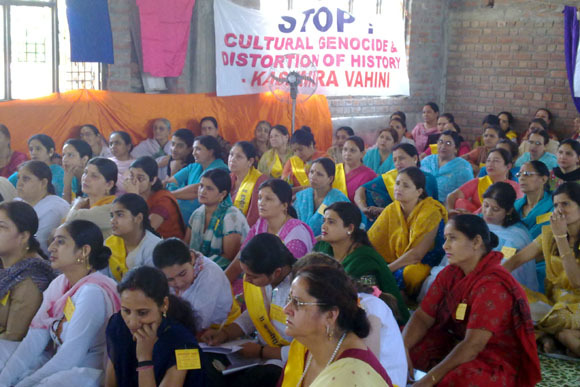 Smt.Sushma Reshi Sr. activist of the Vahini dwelt at length about the role and future line of action of the organization. Nirmal Tickoo a senior activist of Vahini presented vote of thanks. The workshop beside others was attended by Prof. Sarla Koul, Dr.Khema Koul, Smt. Jaikishori senior artist of the community, Smt. Veena Koul, Smt. 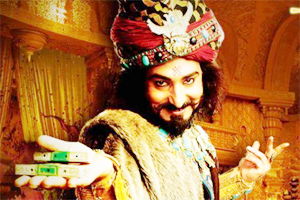 Vijaya Khoda and Archana.